Tens of thousands of organizations that have invested in Microsoft SharePoint but most continue to face a common roadblock: how to effectively and efficiently onboard employees to SharePoint 2010, SharePoint 2013, SharePoint 2016, or SharePoint Online, enabling to use the solution to help with there jobs but doing it with minimum friction. Adopting any SaaS technology can disrupt operations significantly, and delays in getting employees to master these new platforms can be costly in both losses of productivity and operational expenses. The sacrifice can be especially wasteful when bringing on new employees. New hires that experience a poor onboarding process carries the risk of leaving shortly after being hired. According to PricewaterhouseCoopers, nearly one in three newly hired employees leave the company— voluntarily or involuntarily—before the end of their first year. The number of employees leaving before the first year is completed has been steadily climbing, creating a huge financial loss for companies. Estimates put the cost of a lost new employee between 50% and 150% of the departing employee’s annual salary. SharePoint is one of the most popular and powerful intranet platforms, but the agony of weak user onboarding has led to many enterprises struggling to get satisfactory productivity levels from it. One AIIM (the Association for Information and Image Management) report found up to 40% of organizations say their SharePoint implementation was not a total success. Of those organizations, 67% cite inadequate user training as the primary reason. Learners can forget up to 70% of the content they are taught within 24-48 hours of formal training. AIIM found that only 6% of organizations feel "they have achieved success with their SharePoint installations", while 26% say they have "struggled to meet expectations", and 28% report that while it's doing the job, "progress has stalled to some extent", 7% reported their SharePoint implementations were just "not successful"
Memory retention can be a big obstacle when it comes to onboarding. Learners can forget up to 70% of the content they are taught within 24-48 hours of formal training. It’s not surprising to note that many recent studies report that our attention spans have dwindled. These two issues have likely contributed to lackluster or unsuccessful SharePoint user onboarding. 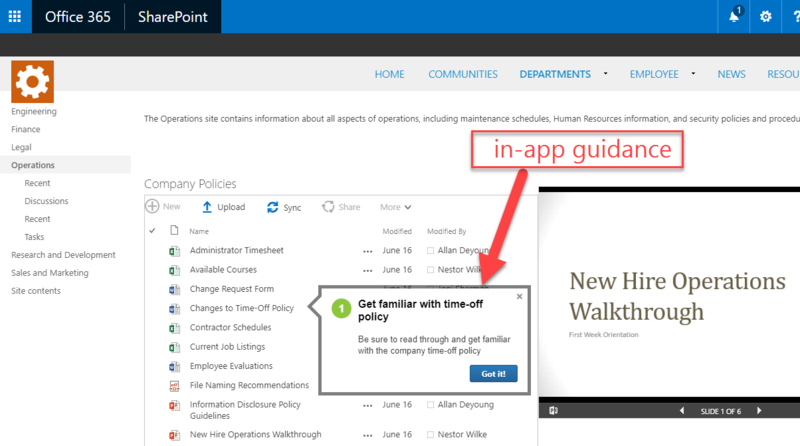 An interactive walkthrough, or guided tour, is a “micro-learning” tutorial that appears as an overlay to the SharePoint environment, giving users a step-by-step flow (or single step) introducing features and capabilities. They are typically delivered in 2-3 step sequences but can grow to ten times that number if describing a more complex or complicated workflow. In some cases, the walkthrough can explain how to complete tasks; in other cases, it can simply provide just some helpful tips and tricks. Walkthroughs are made up of “bubbles” that usually contain instructions and navigation buttons. 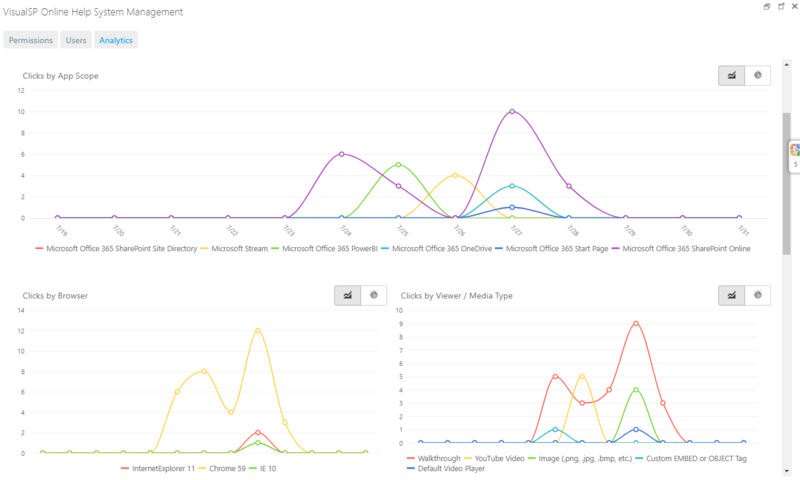 Bubbles appear on the screen at various locations, pointing out key spots in the SharePoint environment. Users have the option to continue through multi-part walkthroughs or end them at any point. A walkthrough is particularly useful when users need step-by-step guidance through a workflow or business process. Users engage with each step, which helps to maximize learning retention, so they learn to use SharePoint faster. As the saying goes, practice makes perfect. Walkthroughs help to provide what is known as the “Aha!” moment—the instant a user absorbs the information they need to perform a task and see the results of their action. Walkthroughs keep users focused through a single step or multiple steps of a process or workflow. When the “Aha!” moment arrives at a moment of need, a walkthrough’s subject matter is more likely to be absorbed. A moment of need occurs in real time—for example when a user attempts to check out a document in SharePoint for the first time. Workers often experience multiple points of need throughout changes in their careers–especially when it comes to new technology. In order to enable successful SharePoint learning, end users must be engaged at the moment of need. They will be more engaged if they are able to learn how to do their jobs in real time via these easy to follow bite-size learning experiences. For most organizations invested in SharePoint getting users to adopt the platform fairly critical since those financial investments can be significant. For information workers, the training experience is critical to strong adoption and faster time to return value from the effort. From the workers’ perspective, the goal when they are learning a new system is typically to get the job done. They are more likely to adopt when they see the value, in the form of making work tasks easy to learn. If SharePoint users can master their tasks with minimal disruption, effort, and friction, SharePoint adoption will often improve, as well as employee morale. User onboarding is a critical time for enterprise adoption. It’s a period where users need to feel at home with a new platform or application, or even a new job or role. Walkthroughs support that needs with an easy-to-follow, engaging delivery. Ensuring that knowledge workers using SharePoint are in compliance and following internal governance policies is a communications challenge. Walkthroughs can be used to make sure employees understand the company-issued methods to complete a task within SharePoint without having them disrupt their work to read an email or attend a training session. For enterprises in heavily regulated industries, compliance is a huge concern. SharePoint can help support company governance, but only if users understand how to complete their tasks appropriately to maintain compliance. Walkthroughs can provide the right level of guidance to manage SharePoint governance without being overwhelming and requiring too much reading of dull regulations and materials. Cash-strapped companies or enterprises with lean IT support teams face the pressure of training employees on SharePoint with limited resources. In some cases, they may leave it up to users to teach themselves - through web searches for text or video materials and/or third-party training sites. Those options require disrupting their workflow, leading to friction and disappointment. They may not even be training themselves on the right answers! Walkthroughs provided in the work context reduces the burden of training and IT support. There is no need for dedicated online or classroom training, which can lead to retention loss following only a few days after completion. Users can access a walkthrough at any time without leaving their work screen, allowing the guidance provided to “sink in” faster and more sustainably. Walkthroughs make a strong communications tool when used to distribute policies governing work processes or key business rules. Management can provide a step-by-step policy walkthrough right where users will be working, which helps workers retain the information. Organizations operating in highly regulated industries can use walkthroughs to distribute policy guidelines in the workflow, specifically to those whose jobs fall within a regulatory or legal review. Onboarding tools such as walkthroughs not only reduce training and support expenses but also shorten the distance between confusion and adoption. A user walkthrough provides a focused delivery that guides users through features and capabilities inside SharePoint, which has been shown to reduce the number of “how to” calls or tickets to IT support by 25%-70%. Many times, new users look to peers or managers to get SharePoint support. Doing so reduces not only the new user’s productivity but also the peer or manager being disrupted. Walkthroughs reduce the need to call on others for the simple “how to” questions. Providing this type of support improves productivity and leads to a more satisfied workforce. Recent research shows that younger workers prefer to manage their own learning processes. Today’s digital-savvy technology users understand that SaaS providers are giving them greater and greater command of their own experiences with applications and platforms. User-driven learning delivers the right amount of guidance at specific times during “need state”, such as when someone is learning an app for the first time, or when a migration or update takes place that requires training updates. 12% reduction in time to proven competency. A walkthrough can enable your employees to immediately operate SharePoint without any prior knowledge. Make sure your employees follow your processes, avoid operating errors, and stay in compliance with your very own walkthroughs with the VisualSP Help System for SharePoint and Office 365. You can help create a tangible onboarding experience, maintain a strong adoption level for all users, and improve your user retention by letting confused users engage and re-engage with helpful guidance through SharePoint walkthroughs. Please visit the VisualSP product section of our website and experience Walkthroughs for yourself. Join over one million active users worldwide. Visit the VisualSP site and review samples of our help content. Download a limited trial to run on your own browser against your current SharePoint or Office 365 installations. Request a full-featured application to deploy on your own environment and let your own users give it a try.